Ready for a story? 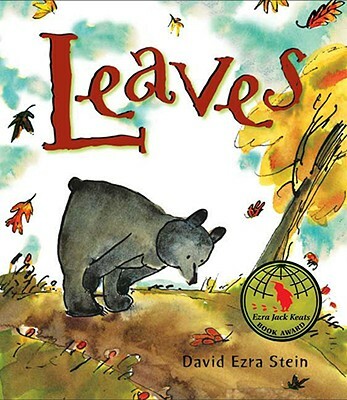 Today's book is Leaves by David Ezra Stein. 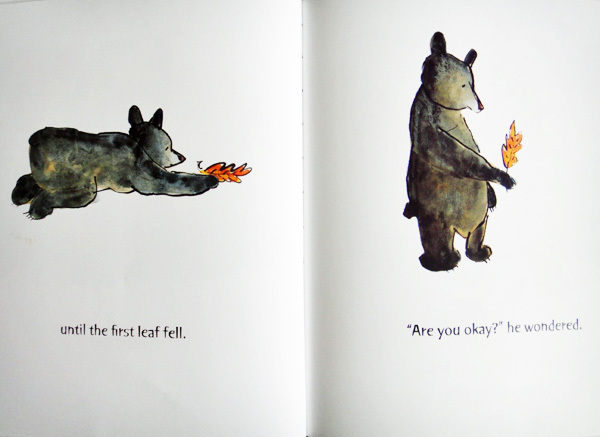 Leaves tells the story of a little bear who sees the autumn leaves fall for the very first time. 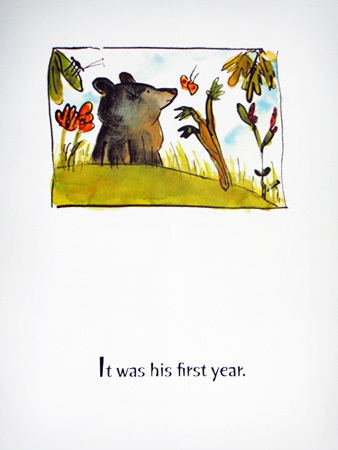 It's a sweet portrayal of a (bear) child's perspective on the mystery of the changing seasons. 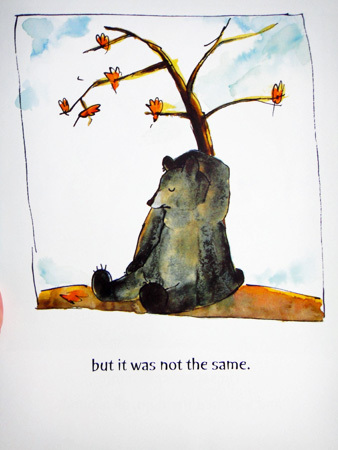 The story is told in simple sentences and simple pictures, giving us an authentic sense of a child's thoughts and experience. ...and he went to sleep. How very kid-like. We see winter come and go outside his cozy hole. He remains unaware of the snow falling or the gradual return of the light. ...and is welcomed to spring by the new green buds. 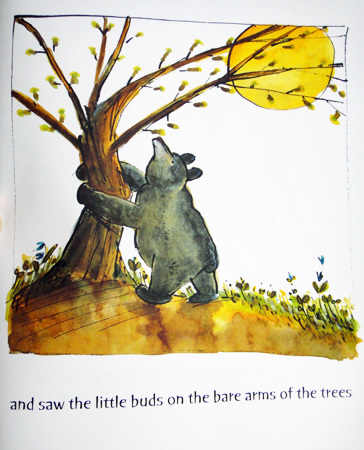 He gives the tree a big bear hug and then jumps for joy at the return of the the leaves and the flowers and the world he knew before. This book is so sweet, I just want to hug it! It shows how special a child's first experience of something can be and what joy the return of something familiar and cherished can bring. 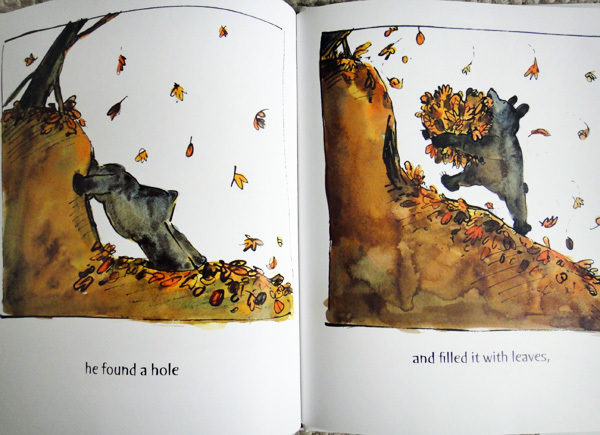 Another of Stein's books, Pouch! , tells a similar story of a baby kangaroo, who takes his first hops away from his mother's pouch. These are special experiences and he turns them into special stories for young children. Check out Stein's website for a free downloadable postcard of little bear and the leaves and a look at how he made Pouch! . And don't miss his hilarious Caldecott Honor book, Interrupting Chicken . This page contains a single entry by Alison published on October 1, 2011 7:36 PM. my tree in the fall was the previous entry in this blog. we all fall down is the next entry in this blog.